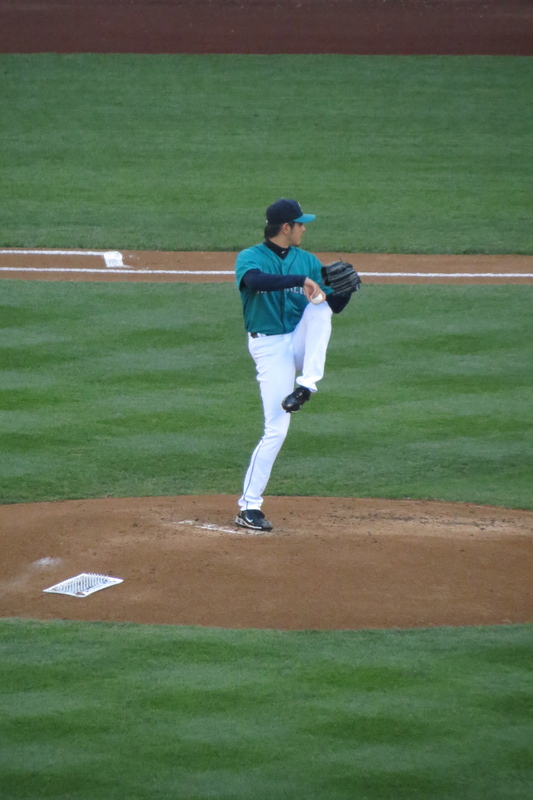 ← Aquasox, Cats and Pirates, Oh My! 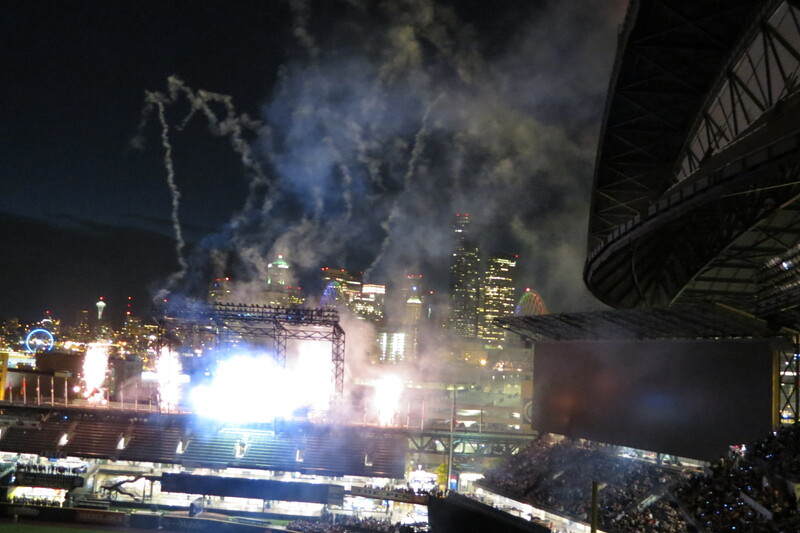 Alternately, How Michael Bay Took Over Safeco Field. 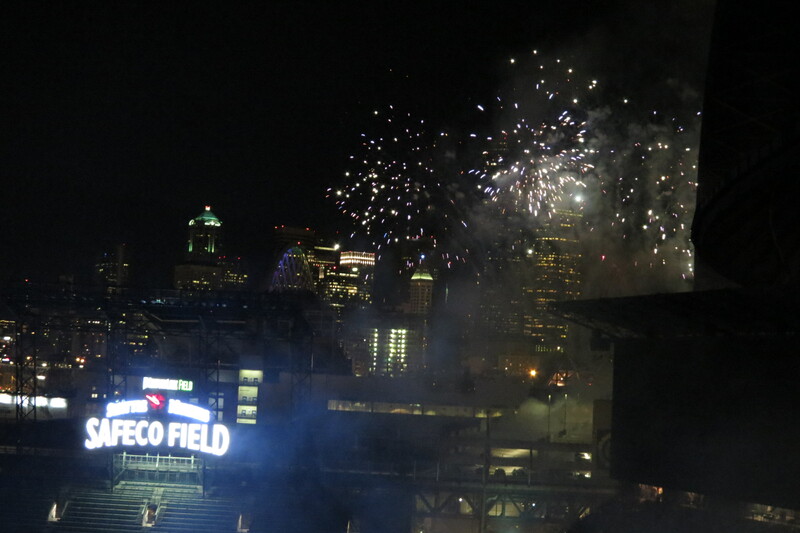 Last night at Safeco, I had at least one moment when I was reminded exactly how much I love baseball. 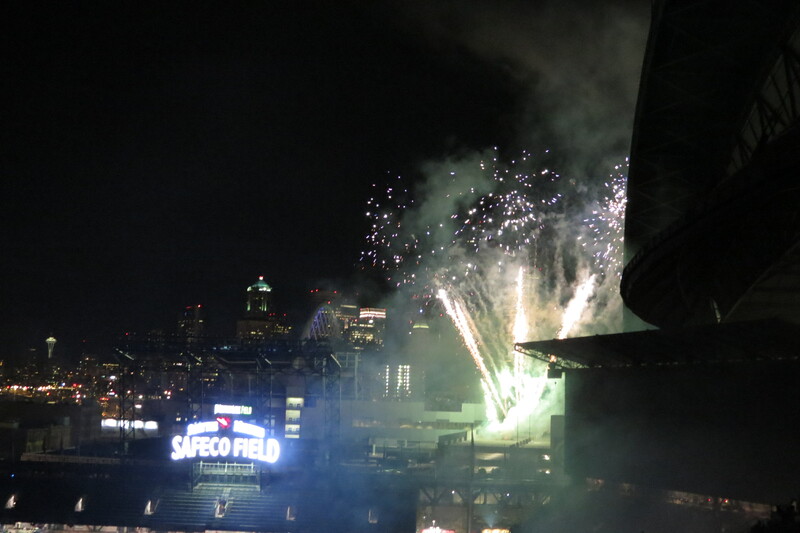 Granted, that moment picked a time to come to me while I was witnessing what looked like really glittery stadium destruction, but it was a moment I haven’t had in a while, and was a culmination of my evening as a whole – irritating drunks in left field and everything. Yesterday was hot. It started out pleasantly enough with a cool early morning walk to the bus stop and a nice day spent in an air conditioned office, but it ended with humidity, sweat, and a blister on the inside of my left foot. Still, very much worth it. When I walked out of my office yesterday, it was like getting hit in the face with a microwave; but there was a breeze, and there were friends and baseball waiting. 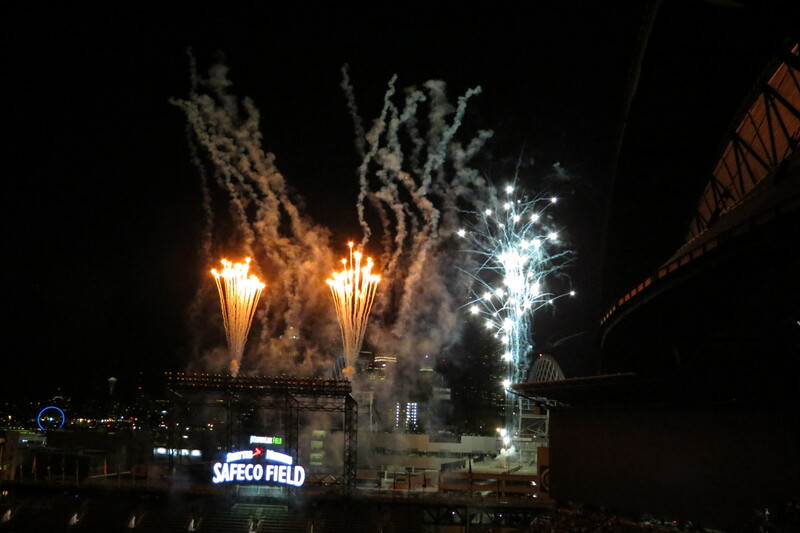 So I had a nice chat with my mom as I walked the mile or so to Safeco from where I work. He was congratulated by those who had lost their opportunity, when suddenly who should walk up and introduce herself to me but the lovely Lisa of Compass Rosy fame! She and her friend whose name I have sadly forgotten were enjoying margaritas that looked amazing (I am currently not drinking alcohol in an attempt to boost weight loss, so I am abstaining), and we chatted for a bit about baseball stuff, like you do. She is a total sweetie, and I was glad to get some time to talk to her that didn’t involve Twitter. 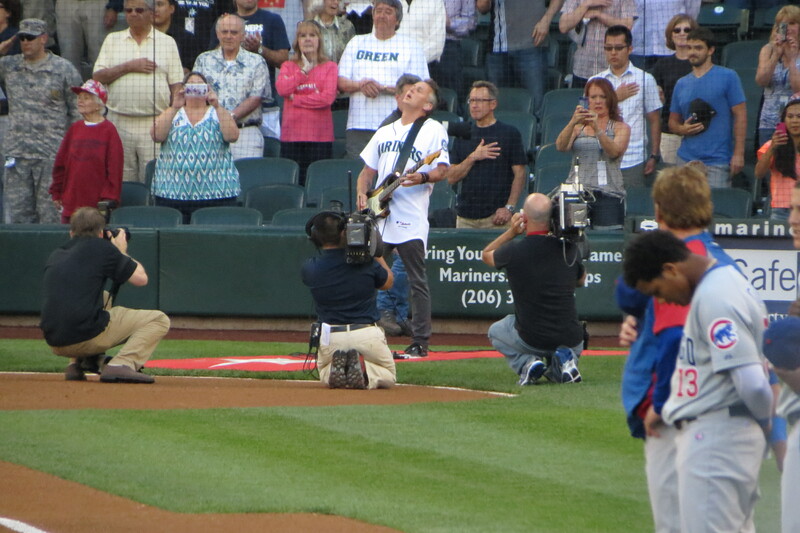 Oh- and Mike McCready from Pearl Jam played the National Anthem again. After our other friends Matt and Nicole arrived, we all split up and went to our seats. When Matt and I got up to section 182 there were of course people all over who should not have been there and were in various states of sobriety. A few totally sober folks enjoying the game, and a group of college students who were apparently in a race to see who could pass out the fastest from beer. 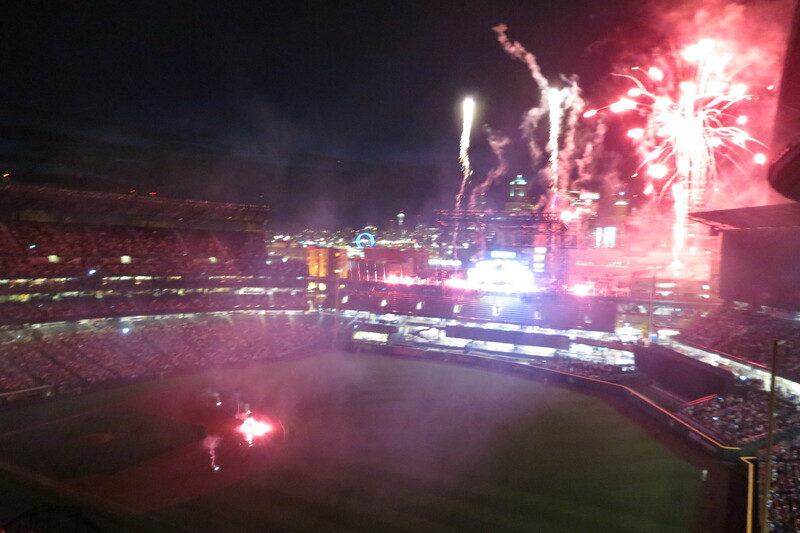 The rest of our group joined us after the first inning had started, and we and the Mariners were off! This one didn’t start out well for the guys. Hisashi Iwakuma was lukewarm, giving up a bunch of runs and leading the score to a sad and familiar 4-1 by the top of the 7th, including two home runs from the Cubbies that were a little depressing. But that changed in a way that was just about unbelievable if you were there. 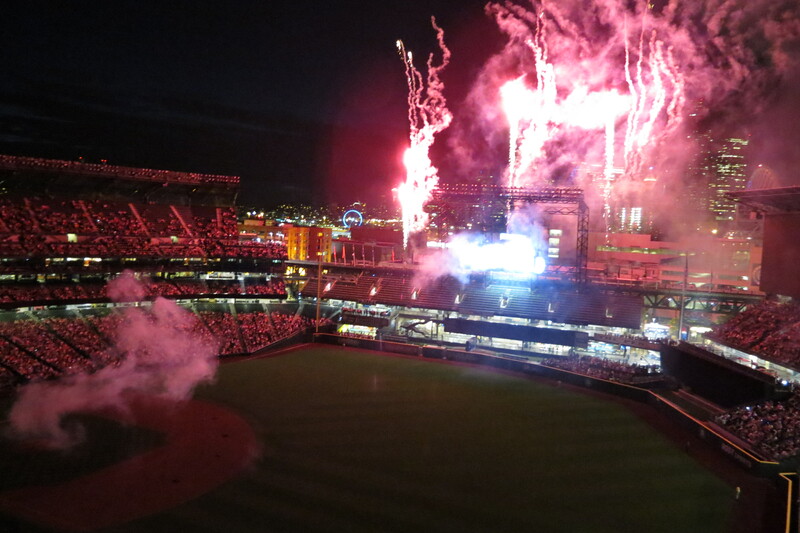 Last night was, in fact, the kind of game that every baseball fan loves being at. 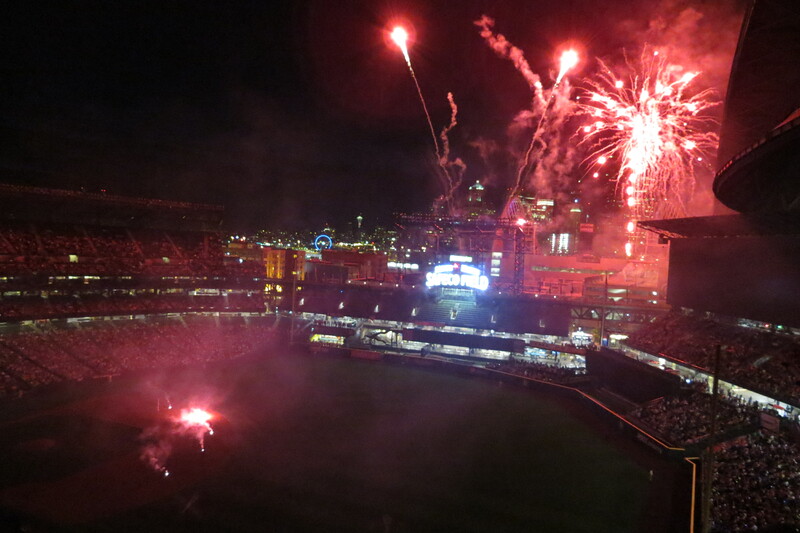 And maybe that was why I was so vividly reminded during the fireworks show of why I love this game. 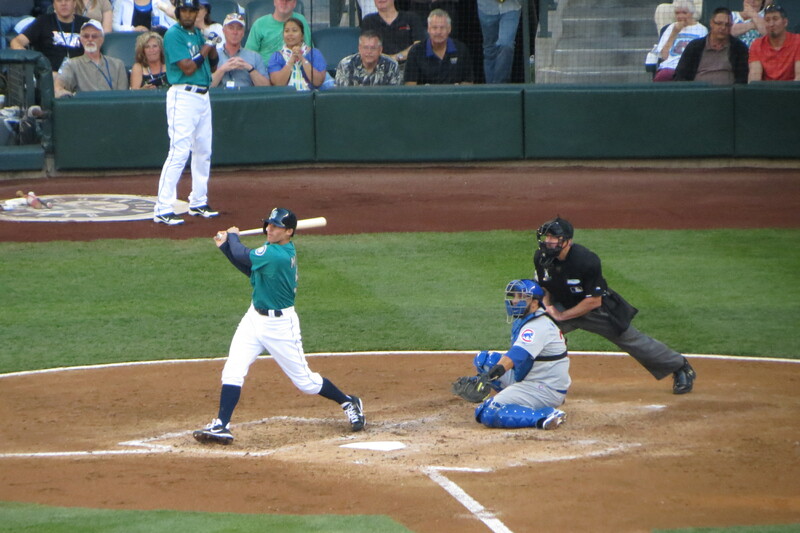 Here, Kyle Seager can be seen in his natural habitat. Nice bat, Morales. 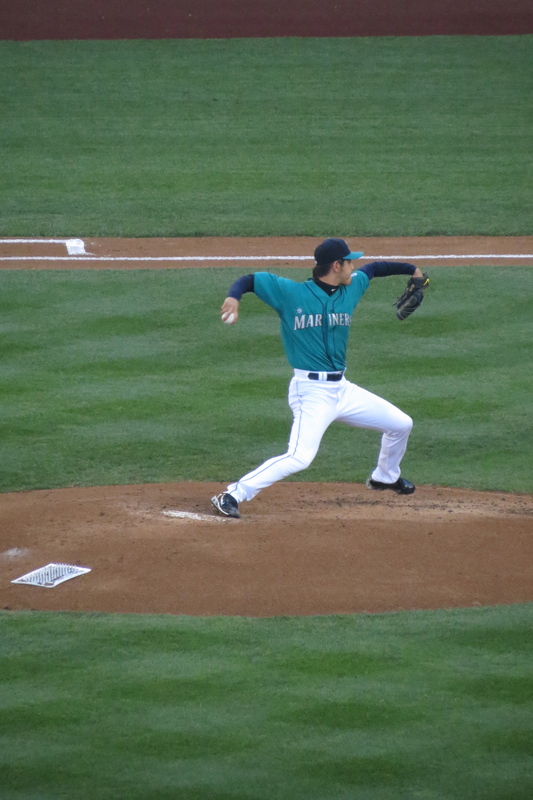 Iwakuma seemed to be favoring a splitter a lot last night. 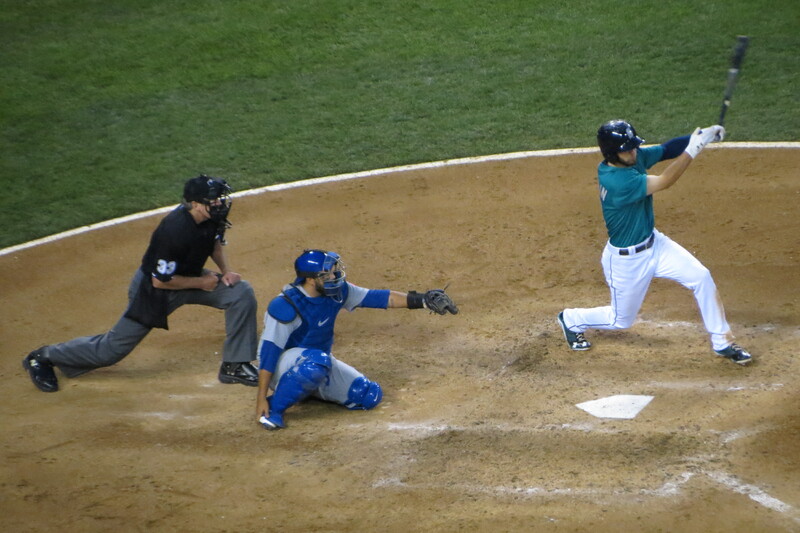 Brad MIller’s first major league at-bat. He got an absolutely rousing welcome to the stadium; I don’t know that I have ever heard a rookie get a response like that before he’s even done anything. Unfortunately, Miller went 0-3, but he was clearly nervous, as he hacked at anything thrown at him on the first pitch. 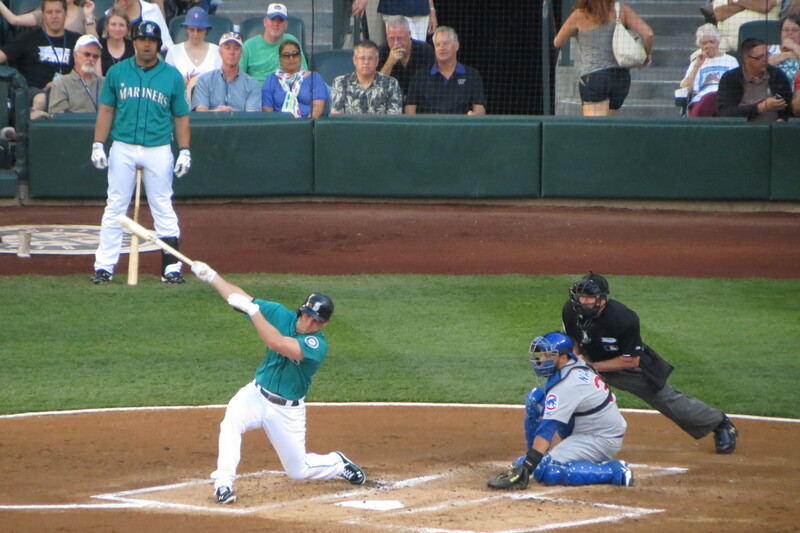 Miller has a nice, even, loooong swing, but his first hit was a short-ish liner to right fielder Nate Schierholtz. More power, more pitch selection, less going for it. Hopefully he’ll get there with major league pitching sooner rather than later. He was doing well enough in Tacoma to be called up, it’d be nice to see that translate here. I ran to get a soon-closing elevator, much to the surprise of the people who were already on it. I am sure it is not often anyone sees a goth running, let alone jumping into an elevator at the last minute at a baseball game. I verified that the third level was what I needed, too, and the elevator guy took us upstairs. 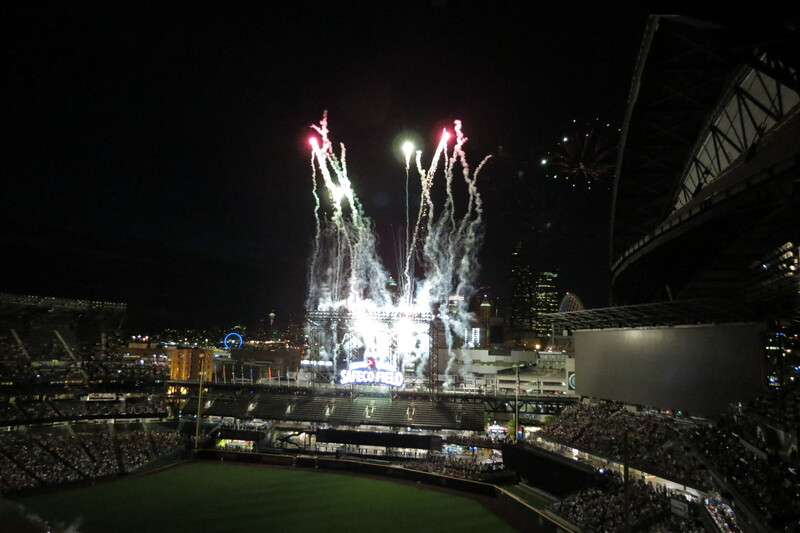 When I got up there, the Mariners were batting again. 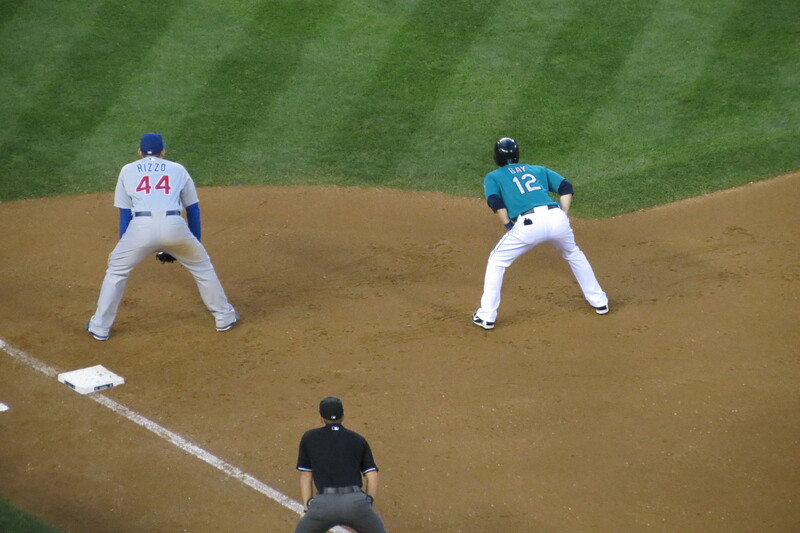 And Jason Bay had a base! Via walking! 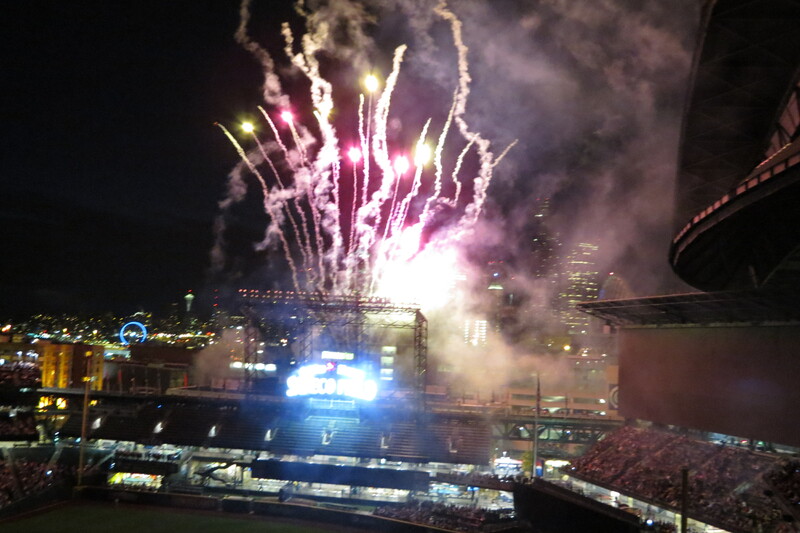 And then Mike Zunino singled after a pitching change! We didn’t do anything with our 7th inning, really, but you could feel the electricity in the air with this tiny bit of offense. The bottom of the 8th of course is when the magic started to happen. With a Cubs pitching change at the beginning of the inning, and a Nick Franklin double and subsequent Kendrys Morales double to score Franklin for our third run of the game, more excitement was building. When Raul Ibanez stepped up to the plate, the crowd was saying “UUUUUUUUUUUUU!!! !” before PA announcer Tom Hutyler even got the chance to start his announcement of Ibanez’s name. 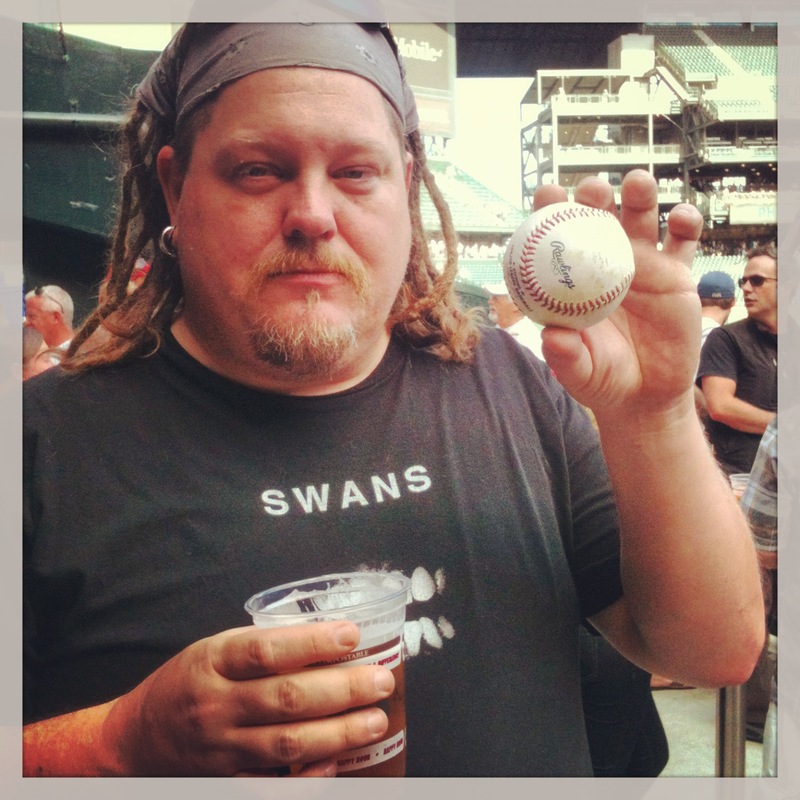 I’m sure the expression on my face made me look like I had just gotten a Christmas present – and I kind of did, because Raul Ibanez hit a freaking triple to left field! The game was tied! Did we actually have a chance of winning a comebacker and then watching things explode?! This was way too good to be true. Iwakuma was taken out of the game in the 9th in favor of Oliver Perez, who has a 0.94 ERA or something ridiculous like that. 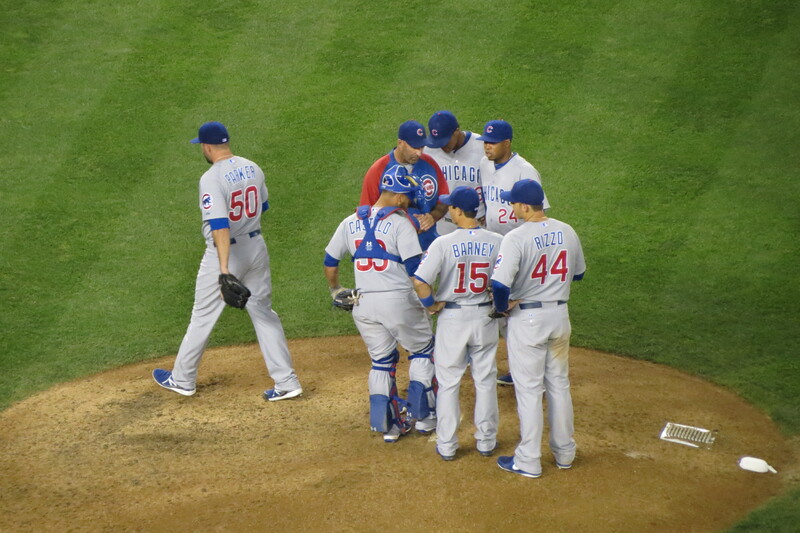 Perez proved to be too much for the Cubbies to handle. Alfonso Soriano and Anthony Rizzo struck out swinging. Ryan Sweeney struck out looking. 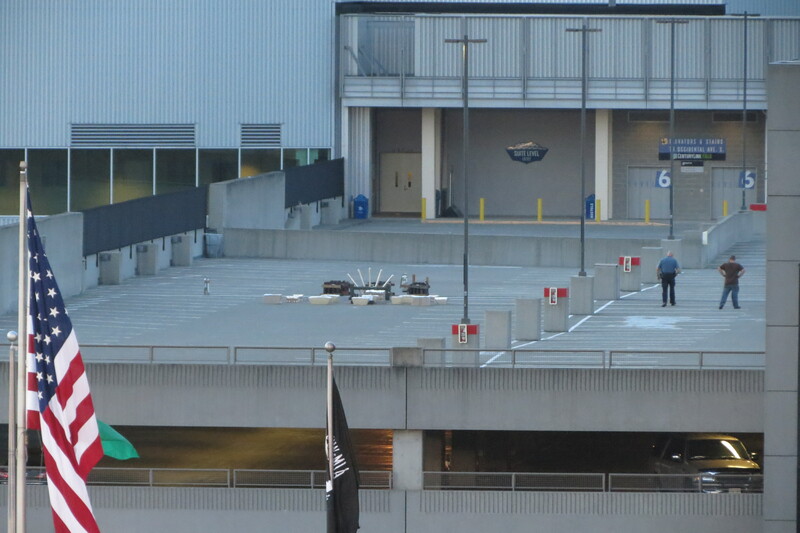 And then extras! Yoervis Medina came into the 10th inning to polish off three batters with the help of his defense, even while allowing a single to Dioner Navarro. 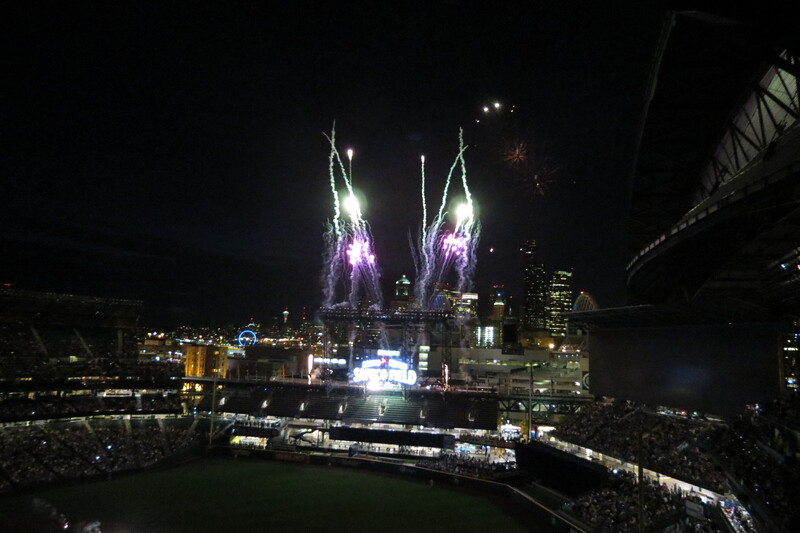 Then, the bottom of the 10th. I wanted nothing more at this point that simply to go home and take a shower; I was sticking to myself, my clothes felt heavy even though they were super loose and wavy, and my foot hurt from a blister because I had opted not to wear socks because I knew it would be warm. So I really wanted this one to be it. Parker was replaced by Shawn Camp. Camp allowed Jason Bay a sacrifice bunt to move runners forward, and then Camp and his catcher decided to walk Justin Smoak to get to Mike Zunino. Smoak’s BA is better than Zunino’s, but Zunino has been known to make contact with a few baseballs; I felt that this was a poor decision on Chicago’s part, but then this happened, so who am I to argue? And that was all she wrote. The atmosphere in the place was phenomenal when this happene, made even more palpable by the fact that everyone was sticking around for fireworks; it wasn’t a cheer-and-leave situation. People chatted with each other, everyone was smiling, it was so much fun. 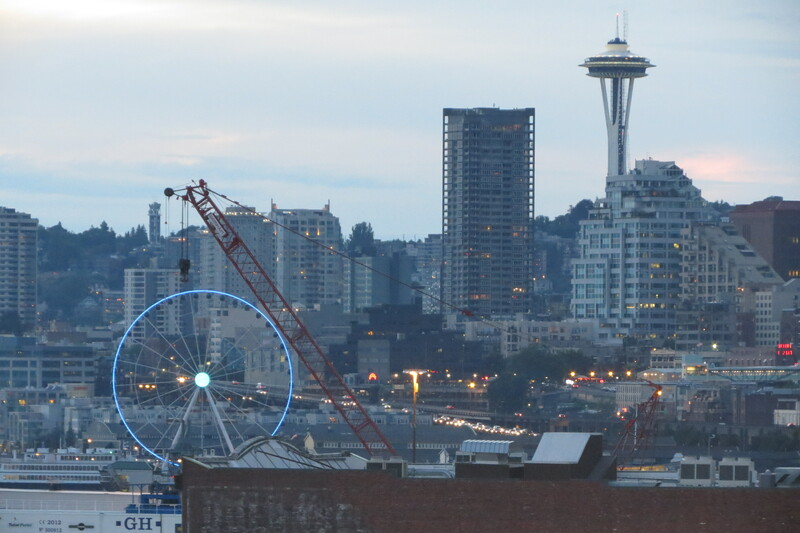 I am hoping that this post communicates that for anyone who was not there. Ethel and Gray had by this point joined me (that is Gray yelling expletives at the Cubs on the video) and we nestled in for the fireworks show. It is at this point that I confess that I attempted to capture the entire thing on video, but it has become apparent to me that I need a larger memory card. So I can only rely on the ineffectiveness of the English language (and my sad command of it) to properly explain what a brilliant job this was on the organization’s part. 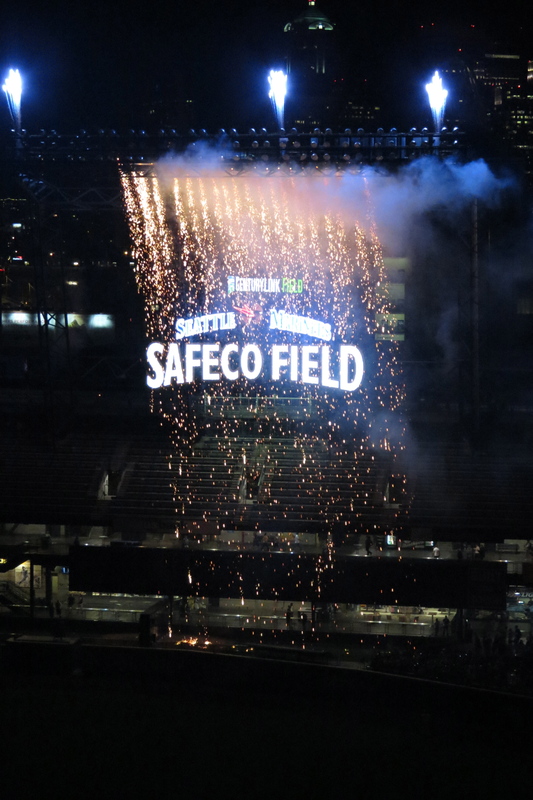 The whole thing started out with some light banks going out, and the big screen lighting up with fireworks graphics while gradually-swelling music played in the background. 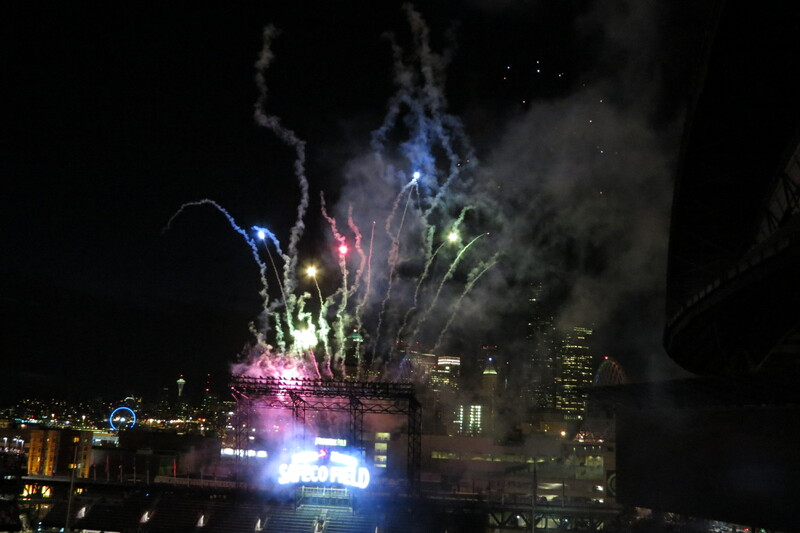 This went on for about two minutes or so while flashbulbs popped off in a darkened stadium. 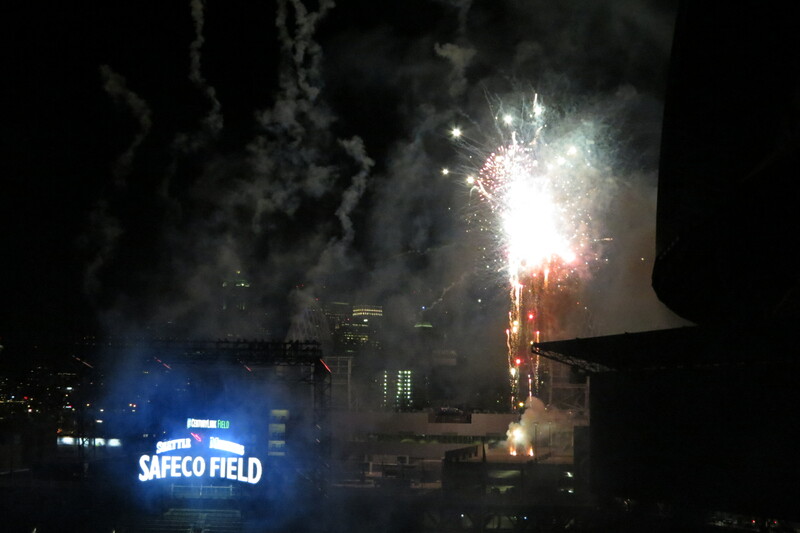 At the apex of this, it was announced that we would be seeing some “more memorable fireworks” or something to that effect, by way of audio clips and on-screen stills of some of the bigger home runs in the team’s history. Dave Niehaus’s voice could be heard on almost all of them. The crowd cheered for all of them with varying levels of noise depending on the popularity in history of the play, and then with the last featured homer, everything went up. You’re about to be bombarded with photos and video clips. They only played the first verse or so of the song, but this was all that happened during that time, just a soft beautiful shower of sparks flying down from the sign while the song faded out to Dave yelling “Swung on and belted! Deep to right field! My Oh My!” during the bridge. If it had gone on for longer, I won’t lie; I would have cried a little. 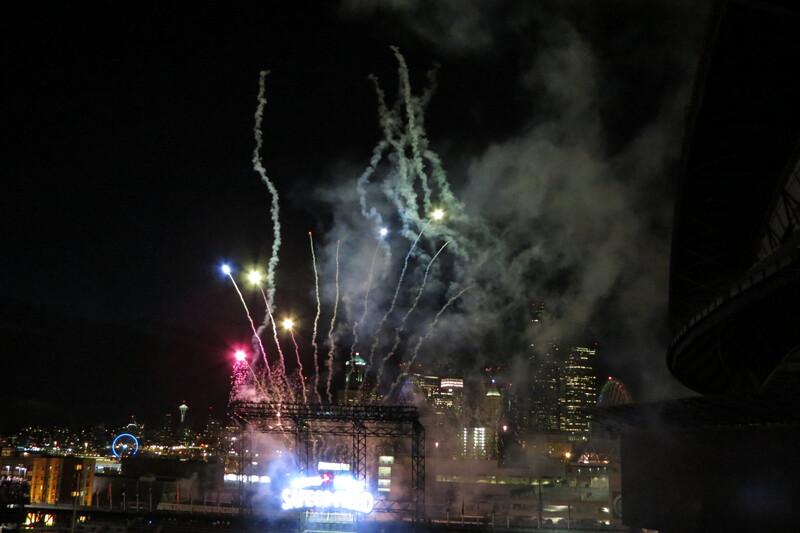 That faded out into “Centerfield”, and more timed and attempted-timed explosions everywhere. 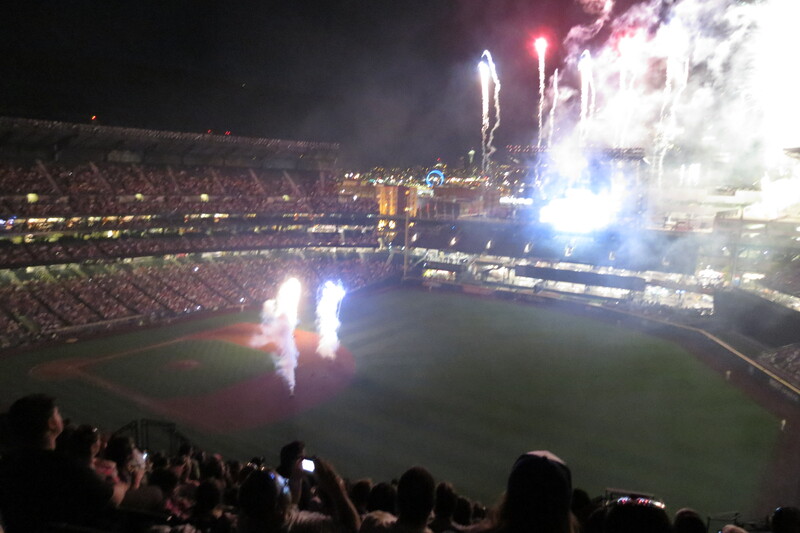 And with that, one of the best baseball games I have ever been to was done. What a night! Today of course is Turn Back the Clock Night. It is just a bit after noon, and I need to drop into work for a smidge today, so I need to stop writing now, but I strongly urge anyone who was not there last night to go to the next Fireworks Night on August 9th. With a debatable ability to have a winning season, and a certainty that we are not going to the playoffs this year, one must find a bit of joy where one can. 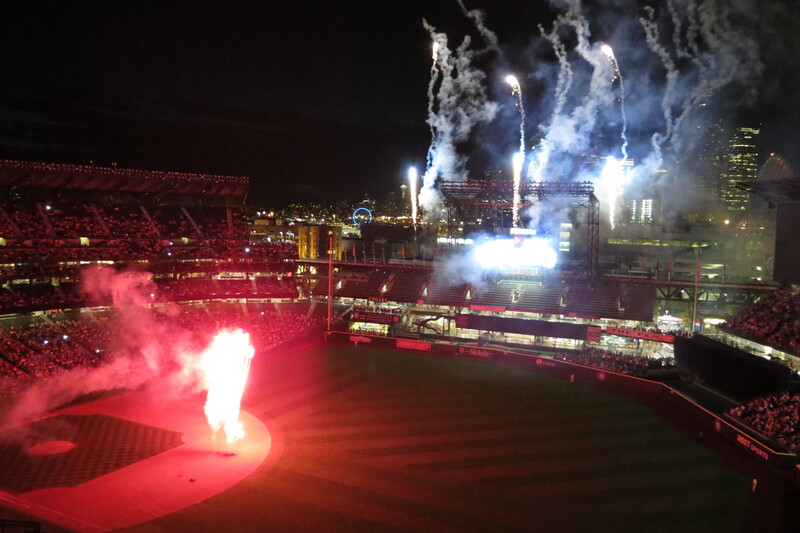 I declare the first Fireworks Night a rousing success for the team and fans alike. Now, I shall don cotton clothing, and spend my day drinking far more water than Nature intended. Cheers!